RECEIVE 10-15% off dental treatments !! For the months of January and February, when you make an appointment for a dental treatment within 1 week of an appointment, you will receive 10% off the total cost of the procedure. If you are currently a Free Vaccine for Life Program member, you will receive an additional 5%, for a total of 15% off the procedure (for current FVFL Members only). The procedure needs to be scheduled to be performed within 1 month. See staff for further details, or to schedule an appointment! If your pet had a painful, infected sore on his/her body, would you wait a few weeks/months/years to address this condition? Would you wait until it affects other systems of your body before addressing the problem? What if you could schedule a procedure that would relieve the pain, treat the condition, prevent further deterioration and infection, and potentially prolong your pet's life for 2 years? Unfortunately, by age 3, 70% of cats, and 80% of dogs have some degree of periodontal disease, which affects the teeth and gums (according to the American Veterinary Dentistry College). But we can TREAT and PREVENT the progression of this disease!! And if dental treatments are performed in the early stages of periodontal disease, not only can we prevent disease and pain, but it will be much less costly in the future. We are pleased to recommend a new dental product by VRS, Entero TruBenefits. It supports healthy gums and teeth, helps to reduce bad breath, supports GI tract health, also. Read more about this and other products at VRS Health. Dogs and cats need dental care, too! Unfortunately, dental hygiene for pets is sometimes overlooked. Many people seem to just expect pets to have bad breath, and few people brush their pets' teeth frequently enough. Dental hygiene is just as important to your pet's overall health as things like nutrition, proper exercise and routine grooming. Help keep your dog and cat healthy - pay attention to those pearly whites, and you may even prolong their lives by up to 2 years!!! Oral disease is the most frequently diagnosed health problem for pets, and 80 percent of dogs and 70 percent of cats by age 3, according to the American Veterinary Dental Society. Plaque builds up on the teeth and turns into tartar, or calculus. These areas grow bacteria and eat away at the teeth and gums. Halitosis, periodontal disease, oral pain and tooth loss can occur. However, the bacteria not only cause disease in the mouth - they can also affect other parts of the body, like the heart and kidneys. The most important thing to do is address dental disease as soon as it is detected, no matter how minor. Better yet, work hard to prevent it! 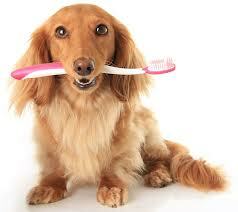 NEVER brush your pets's teeth with human toothpaste - it can make your pet sick! Use special enzymatic toothpaste made especially for pets. The same goes for oral rinses. Plaque begins to turn into tartar / calculus within 24-48 hours, so daily brushing is recommended. Work your pet's tooth brushing into your own routine - consider brushing his teeth around the same time you do yours so it will be easier to remember. Use a "finger brush" or special long toothbrush designed for use on pets. When starting out with brushings, the finger brush can help ease your pet into it, as these do not feel as awkward as hard brushes. Before you begin, ask your veterinarian to show you some techniques to make tooth brushing easier on you and your pet. If you are not able to brush your pet's teeth, there are other options. Consider using oral rinses made especially for pets. You can also purchase special dental treats. Avoid real bones - not only can they lead to gastrointestinal upset, they may also cause tooth fractures. Most of all: make sure you keep up with veterinary exams. From time to time, a professional dental cleaning may be recommended. This requires general anesthesia. During the procedure, your pet's teeth and gums will be examined closely for problems. The teeth will then be scaled and polished. If dental problems are noted, oral radiographs and/or tooth extractions could become necessary. Alternatively, you may be referred to a veterinary dentist for specialty procedures. Some dogs and cats need dental cleanings one or more times per year, while others can go longer. Be certain to follow your vet's recommendations. And remember, what you do at home can really make all the difference. For more information about cat dental disease, click here. For more information about dog dental disease, click here.